If you haven’t been to the State House in Concord, you’re missing a historical treat. It is the oldest statehouse in the United States (completed in 1819) and the legislature still sits in its original chambers. You can take a self-guided tour or stop by the Visitors Center and perhaps you may be able to get a guided tour. Throughout the three floors of the State House you’ll see portraits hanging on the wall of past elected officials. On the first floor is one in particular that caught my eye. 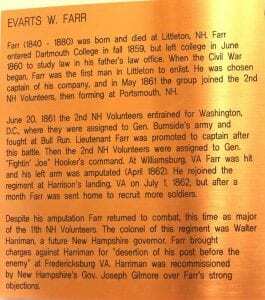 It is that of a Major in the 11th Regiment Volunteer Infantry in the Civil War: Evarts W. Farr. After the war, he studied law and became a two-term Congressman from New Hampshire. 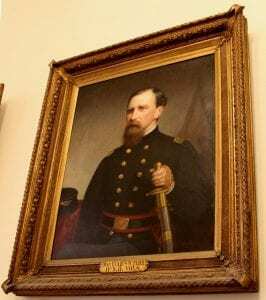 The text under the portrait says that Major Farr was shot in an engagement in Williamsburg, Virginia in April of 1862 which resulted in the amputation of his left arm. But…the portrait clearly shows the Major holding a sword with his left arm. A call to the Visitors Center (271-2154) erased the confusion. The plaque is wrong and the portrait is right. The correction is being made to the plaque as of this writing. But it’s things like that that help make a special connection with New Hampshire’s past. Check out the Hall of Flags while you’re there which features 107 New Hampshire battle flags representing the Civil War, Spanish–American War, World War I, World War II, and the Vietnam War.